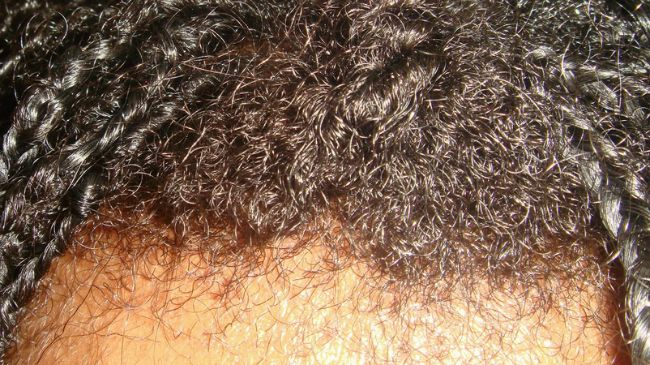 Do You Have Hair Breakage, Or New Growth? Q: "How can I tell if the short hair I see is new growing hair or broken hair?" A: This can often be very difficult to determine, especially if the “short hairs” are in areas where breakage can occur (around the hairline, etc.). Your first task would be to examine the hair closely and look for signs of stress on the hairs – such as split ends, stretching, etc. If there are signs of stress or damage, then breakage is the likely cause. This can be doubly certain in cases where breakage would be expected. For example: an individual wears his/her hair in, say, a tight ponytail and begins to notice short hairs at the forehead and temples. This new growth of hair will not be found in great numbers. Since only 10% of the hairs on average are in a resting phase at any given time (the rest being in a growth phase) and the hairs are shed following the resting phase as the new hair pushes the old hair out of the follicle, you would generally only see 10% of the hairs on your head as these short, newly-grown hairs. Breakage becomes less likely when the short hairs are found in places on the scalp that aren’t exposed to significant stress from the styles worn. Are the ends of the short hairs tapered or blunt? 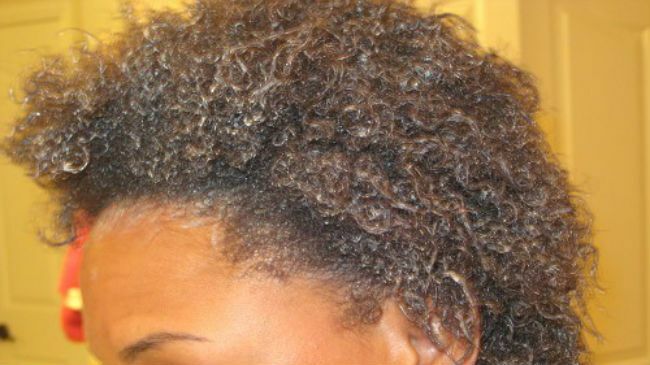 Tapered hairs tend to be new growth whereas blunt and split hairs or hairs with white ends are indicative of breakage. Does the majority of the hair on your sink or in your comb/brush, have “roots” (white bulbs) attached or are many/most strands rootless? Strands with white bulbs are shed hair and not breakage. Do you hear snap, crackle, pop when combing or manipulating your hair? If you do, it’s probably breakage and the best thing to do is handle your hair more gently and ensure that it is well lubricated/saturated (with a pre-poo or conditioner – some prefer wet hair and others on dry) before attempting to detangle slowly from ends to roots. I prefer to finger detangle first as I’m able to feel the bad knots and tangles in order to gently ease them out, rather than ripping through them with a comb/brush. Do you have a lot of split ends and/or SSKs? Both of these can cause breakage as the splits and knots can/will snag on adjacent hairs and cause additional damage. I’m a fan of the S&D method to keep knots and splits to a minimum. Do you use heat often and/or forgo heat protection? Do you re-apply heat to “dirty” hair? Try reducing or eliminating direct heat. Opt for roller sets and silk wraps rather than a flat iron if you want straight hair and always use a heat protectant. Keep the passes over your hair to a minimum (1 0r 2) if you must use a flat iron or curling iron. Only “press” freshly clean and 100% dry hair. Do you use hair tools with metal parts or materials that can snag or tear? Do you protect your hair at night? Opt for barrettes, clips and hair elastics without metal parts, such as Goody Comfort Flex Barrettes, Ouchless ponytail holders, banana clips and satin scrunchies. Sleep on a satin pillowcase and/or wear a satin scarf or bonnet. Is your hair well moisturized or is it often dry and brittle to the touch? If so, are you moisturizing with a water based styler or leave-in and sealing with an oil or butter? Have you tried weekly deep conditioning treatments with a moisturizing DC? (There is an ongoing debate on the hair boards about the effectiveness of DCs and DCs with heat, but I am a believer. I believe the only way for you to know if they will make a difference for you is to give them a try.) Are you overdoing protein DCs and/or not using a moisturizing DC as a protein chaser? How do you style your hair? Too much tension on the hair, especially fine and fragile curly hair, can cause damage. I personally opt for low manipulation and protective styles that I can wear for 2-5 days. I’ve also grown MBL hair with WnGs, so it is possible. However, everyone’s hair responds differently and to different things. The key is finding what works the best for you. That being said, in 2010 I experienced two things. Once, I had breakage along my center part in the Winter of 2010, which I suspect was caused by using a protein-based gel (my hair and protein don’t get along well). In addition, my hair began shedding like crazy and I think that was caused by using amla in my henna, which my scalp did not like. I stopped using that protein gel last Spring and it appears that I have finally resolved my excessive shedding problem by discontinuing use of amla and avoiding getting conditioner on my scalp. As I don’t see a lot of breakage, rarely hear a snap, crackle and/or pop and it appears that the end of my short hairs are tapered, I believe my hair is in the recovery phase where the hairs that broke and shed are regrowing. Although I’m certain the short hairs represent more than 10% of my hair, knowing that I’m taking care of my hair as well as I can and am employing a well-founded regimen and techniques, I don’t worry about it. If you think that you are experiencing mechanical damage, then take a closer look at your regimen and/or techniques. However, if your regimen and techniques are on point, breathe a sigh of relief because those shorts hairs are most likely new growth and the result of your healthy hair efforts! !